Some reviewers loved its lightweight structure. Many wearers mentioned that the New Balance Minimus 10 v1 was one of the most supportive shoes they have ever worn. Some of the purchasers agreed that the shoe has a durable outsole. A good number of wearers commented that the cushioning was great. The New Balance Minimus 10 v1 was comfortable, according to many runners. Several testers loved its flexibility. Many consumers noted that the shoe was breathable. The majority of the buyers noted that the shoe provided enough stability. Based on some reviews, the New Balance Minimus 10 v1 was stylish. A handful of testers said that the shoe was great for walking, mountain biking, kayaking, hiking, running and casual occasions. Some users commented that the shoe is not recommended for high-impact movements. Based on observations, the New Balance Minimus 10 v1 runs small. According to runners who have tried it, the upper mesh ripped easily after several uses only. The shoe has a narrow toe box, noted by some of the users. A lot of runners wished to have other color options available. With the fantastic stability, support and fit that the The New Balance Minimus 10 v1 provides, a lot of users were made satisfied and happy. Aside from its well-constructed structure, the shoe also offers the right amount of comfort, style, and traction when used in various trails. While others have issues with the toe box and size, others still lauded the shoe because of its versatility and performance. Overall, the New Balance Minimus 10 v1 is an excellent choice for those who are looking for a breathable, comfortable and durable running shoe. I had the opportunity to get hold of a shoe of my choice and after a lot of searching, I came across the New Balance Minimus 10v1 Trail. As a highly rated minimal shoe, it seemed like a great choice so I took the plunge. I’ve tested the Minimus Trail for around 50 miles over a lot of different terrains. On roads, paths, gravel tracks, rocky trails, beaches, boggy fields and very muddy routes. If it wasn’t for the sizing issues I had with this shoe it would probably be my go-to shoe for almost every situation! The Minimus Trail was first released in 2011 and seems to have been quite a popular shoe. Over the past few years, new versions have been brought out and changes made, however, the original design has always been thought to have been the best. New Balance has recently reset the clock on the Minimus Trail and the first version is now back! Let’s see what this highly popular minimal trail shoe has to offer. My third run in the Minimus was a 7-mile cross country race and it was VERY wet and muddy. Unfortunately, the shoes shrunk so much when they dried out after the run that the rest of my runs have been very uncomfortable. As such I haven’t been able to review these to the standard I would usually like to. I definitely should have gone for a bigger size (even though I used the New Balance “Fit Finder” and it told me UK 10.5 so I went for an 11!) however, I’m fairly certain that a trail shoe shouldn’t shrink this much either. I did reach out to New Balance in the hope that they might send a replacement pair for me to be able to give them a better review but as yet they have not responded to me. Upper: Synthetic/mesh. Odor-resistant treatment to reduce odor. Midsole: ACTEVA™ Foam is 24% lighter than New Balance’s standard compression molded foam for optimal compression set properties. Outside: Vibram® rubber provides maximum surface contact and multi-directional traction. This style runs small. New Balance suggests ordering a 1/2 size up. These lightweight trail shoes from New Balance look great! If I could design and build a running shoe (if I knew how to) I would make it look like the Minimus Trail. They're sleek, lightweight and the colours are great! The upper on the minimus is really well designed. It’s a lightweight mesh outer with sandal-like straps across the back of the heel and the top of the forefoot. The inner material is soft and cushioned enough but not over the top. The M10v1’s feel as though they have been well thought out. I don’t think they could have made them any lighter without starting to compromise on build quality. I frickin’ love the laces on these trail shoes. They're actually probably one of my favorite bits about the Minimus Trail. Does this make me weird? Maybe. Do I care? No! They're nice and thick so they don't cause any pain on my upper foot, they grip fantastically and they look really good too. There’s no real heel counter in the Minimus. There’s a strap-like band that goes around the back of the heel that supports it. It’s very comfortable and works very well. The collar is very minimal. It isn’t overly padded but it doesn’t suffer from being uncomfortable. It’s minimal and doesn’t add unnecessary weight. The tongue is simple but effective. It’s joined to the inside of the shoe almost all the way up so it’s very effective at stopping stuff (dirt, gravel, dragons etc.) getting in to cause problems. The sole of the shoe comes up around the toe a bit to form a sort of bumper and there’s a thin overlay at the toe end that’s presumably designed to make the shoes more durable. I haven’t had any issues with toe stubbing which (considering how much my toes touch the ends of the shoes) has been a relief. Whether that’s just luck or the bumper working I can’t be sure though. New Balance’s Activa midsole coupled with a superb Vibram outsole give the M10v1 sole a firm, responsive feel whilst still feeling light and flexible. Initially, it was quite rigid but after a few runs, it seemed to become more supple. I get reasonable ground feel through the sole but it’s not too thin, which means that I don’t feel like I need to slow down over sharp rocks and roots. With a low 4mm heel to toe drop, they’re ideal for my forefoot running style, I don’t feel as though I’m constantly running downhill in them. There’s no insole with the Minimus. It definitely doesn’t need one. If anything it’s better not to have one because it means one less thing to slide about inside the shoe. I get more than enough support from the Minimus underfoot, it has a low arch and for me that’s ideal. I am a fan of minimal footwear so for me the less going on under my feet the better. I think New Balance has done a good job balancing support vs minimalism with the Minimus Trail. The Minimus does an amazing job of being flexible, especially considering that it has a foam midsole. With the help of some very well places flex-grooves, I’d say that it competes with barefoot shoes in this department. The outsole on the M10v1 is something a bit different. It’s like a load of little discs all connected by strands of rubber, they look flower-like. I’ve read a few reviews where people have said that the discs detach from the foam but I haven’t had any issues with durability in that way. They do seem to be wearing down rather quickly however, especially in the area that I tend to land (outer forefoot/little toe) and I’m not really sure how long this sole will last long term. In a word, great! Great grip on the road and great grip on rocks, tracks, and trails. It was also ‘great’ fun trying to stay on my feet on the mud (they don’t grip on the mud). But I’ll forgive them that. They’re not really designed to be mud runners, I probably should have known better than to put them through a muddy trail race! My personal experience here has been slightly ruined due to the shoes being too small. All I can say is don’t trust New Balance’s Fit Finder, it didn’t work! I went half a size larger than the size the ‘Fit Finder’ suggested and they’re still too small: and that was before they shrank even more after the muddy race I did (my 3rd run in the Minimus). Needless to say most of my 50 miles in the M10v1 have been quite uncomfortable. That being said I think had these fit well they would be really comfortable in the right size. The lining of the shoe is soft and it hugs my foot really well. The overall feel of the Minimus Trail is akin to the Vibram Fivefingers KSO Evo, which I love! When I put the Minimus on it almost feels like it’s been stitched around my foot, it’s that well fitting. The forefoot strap ensures my foot is locked down where it needs to be and it doesn’t slip around. It takes a little getting used to but I definitely like the idea. There’s one potential issue with the interior of the Minimus and that’s the stitching that holds the base to the sides. It looks a bit ropey in places. This could just be my pair I don’t know. It’s not a problem at the moment but I expect better from someone like New Balance. There’s ample room in the tox box, it’s wide and foot-shaped. Obviously for me, I didn’t really have enough but I can tell from my smaller foot that the Minimus was designed with feet in mind. They’re not as comfortable as the Vivobarefoot Primus Trail in this area but have far more room than your average shoe. The heel is probably the most comfortable out of any shoe I’ve worn to date! The heel strap holds my foot firmly whilst the lining of the shoe provides all the comfort I could ask for. The Minimus Trail 10v1 is responsive, lightweight, not too cushioned and it grips really well. Considering it’s touted as a trail shoe, it does really well on the road! Unsurprisingly these are great off-road. They grip well over most terrain whilst giving my feet enough protection that I feel comfortable to really let go on the trail. Not the fastest of shoes but nowhere near the slowest. Off-road, I feel about as fast as I think I could with any pair of trail shoes. They’re not so sprightly on the road. That’s to be expected though considering they’re very light so there’s really little to complain about. I’ve not gone further than 10 miles in the Minimus but I’d say that they would be fine for longer. I just couldn’t bear going too far in them due to the size issue. They’re light and comfortable enough that they’re ideal for any distance. If you know a shoe you make is small, maybe adjust the sizing for that shoe? Then make the sole a bit more durable and the inner look a bit tidier and this shoe is pretty much perfect. Otherwise, it’s great, thank you for bringing it back! The New Balance Minimus Trail 10v1 is a well-designed shoe. There’s a lot to like and I can see why so many people rave about it. I’m gutted that I didn’t get to experience it properly but once I get a chance to, I’ll be buying a replacement pair in the right size for sure. I see this shoe as a must have for the collection as it fills the gap between road and trail perfectly. I don't think it has to be saidm but as far as dislike to like to love? It's a love. They're actually very comfortable barefoot. It's a comfortable, but snug shoe that handles the road and trail with equal ease and provides precisely the kind of fit and design as previous iterations. The New Balance Minimus 10 v1 is a trail running shoe that is strategically designed for runners who have neutral foot mechanisms. The Vibram outsole is used to deliver enough traction on a wide variety of surfaces. With the utilization of the mesh upper, flexibility is encouraged. Because of this material, added breathability is also offered. Featured in the midsole is the Acteva foam. The purpose of this material is to add comfort during the running session. The shoe length runs true to size, and it provides a more breathable and comfortable fit for medium-footed runners. The New Balance Minimus 10 v1 has the available widths of D - Medium for the men's version and B- Medium for the women's version. The Vibram outsole is integrated into the New Balance Minimus 10 v1. This material aims to deliver the maximum amount of surface contact that the runner needs on different types of trails. 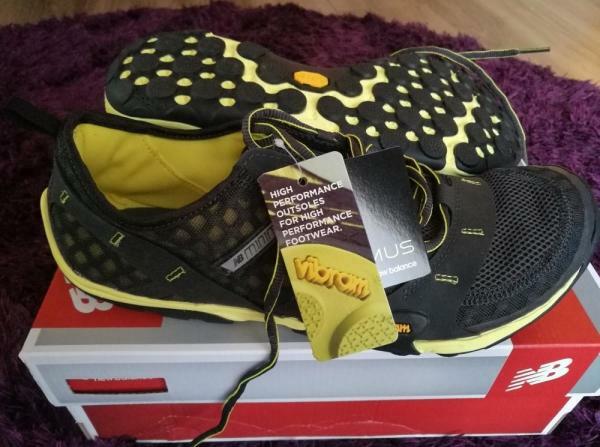 The Vibram outsole is also used in the NB Minimus 10 v4. Along with the Vibram outsole are the flex grooves. This component of the shoe offers the right amount of grip and durability, especially on rocky surfaces. Featured in the midsole section is the Acteva foam. This foam material is similar to EVA foams. The only difference is that the Acteva is lighter when compared to the standard EVA foams. The primary focus of this material is to provide optimal compression to the platform. As a result, a more responsive and comfortable ride is experienced by the runner. The shoe utilizes the mesh upper. The use of synthetic materials provides breathability to the platform. As a result, the foot is kept fresh and dry during the running activity. The use of comfortable fabric lining encourages a more fantastic in-shoe feel. With the utilization of Antimicrobial treatment, a fresher and healthier in-shoe feel is encouraged. Moisture and odor are then prevented in the foot chamber. Used in the upper area is the lace-up closure. This component of the shoe delivers a more customized fit. The thin tongue and lightly cushioned collar are integrated into the New Balance Minimus 10 v1. These materials add comfort and provide the user with a hassle-free running experience. For added comfort, the thin textile footbed is utilized in the shoe. New Balance thought of adding the midfoot wrap as well. This material is essential in helping the foot to stay in place. Along with the premium performance foam, lightweight support is offered.